The region’s highly segregated education system undermines equal opportunity for children in low-income and black and Hispanic communities, and reduces the region’s economic prosperity. Segregation is supported by existing school-district boundaries that divide the region by race and income. This fragmented system also leads to inefficiencies and unfair property tax burdens. States should provide resources, incentives, and guidelines for school districts to consolidate and implement successful models of racially and economically integrated school. Educational achievement is one of the most important determinants of personal well-being, and a key to the success of the region as a whole. It is a strong predictor of personal income, upward mobility, health, and longevity—and increasingly separates prosperous from declining metropolitan areas. Unfortunately, the large gap in achievement levels that stems from a long history of inequities for poor, black, and Hispanic families is a crisis for the region as well as the nation. While educational outcomes are determined by many factors, including prenatal care and neighborhood conditions, the type and quality of schools can make the difference between success and failure. In the tri-state region, half of the elementary schools in predominantly low-income and non-white communities have low academic achievement when measured by fourth- and eighth-grade test scores, and only a small percentage are among the highest achieving. Test scores do not necessarily reflect the quality of instruction or leadership, but they are the best available indicator for comparing school outcomes across the region. And there is ample evidence that low-income and non-white students who attend high-achieving and integrated schools perform better than those who attend low-achieving, segregated schools, and that higher income and white students benefit as well. In all three states, the large number of school districts reinforces segregation, creates inefficiencies, and unfairly distributes property tax burdens. More than three million students attend school in 686 school districts across the tri-state region. Half of these districts have fewer than 2,000 students, and 113 have fewer than 500 students. New York and New Jersey have some of the highest numbers of small school districts in the country that are in close proximity to each other. By many measures, these small school systems are among the most racially and economically segregated in the United States. New York is the most segregated state in the nation when ranked by the exposure of black students to white students, and New Jersey and Connecticut rank sixth and 14th, respectively. By a broader measure, school segregation on Long Island is twice the national average. The segregation of our school districts is largely due to school districts being determined by municipal boundaries, with most people in the region living in segregated communities. As a result, most of the region’s poor and non-white students are concentrated in large urban districts, while white students predominate in small suburban and rural districts. A recent study found that, on Long Island, schools within the same school district were similar to each other, but schools in different districts were significantly different from each other, segregated by school district boundaries. A different study found that segregation in New Jersey was driven by school district boundaries, which are largely coterminous with municipal boundaries. Fragmentation also means many services cost taxpayers more than they should. Larger districts benefit from economies of scale, and therefore pay less per student for superintendents, teachers, administrative staff, transportation, and supplies than smaller districts, often without sacrificing the quality of the education. 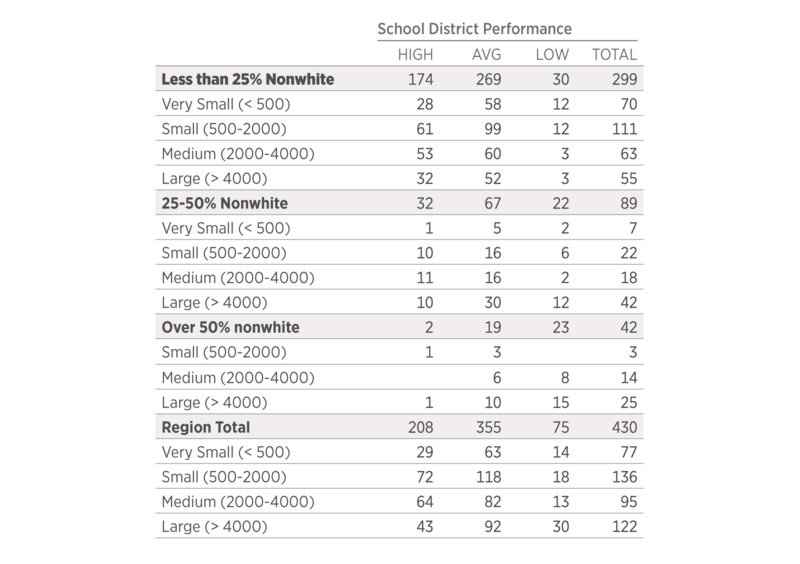 Low performing schools are concentrated in low- income and nonwhite neighborhoods. The schools in my neighborhood have many more children in the classroom than schools in wealthier neighborhoods like Black Rock and Trumbull. There is much that school districts can do, on their own or in collaboration with other districts, to reduce segregation and improve education outcomes. Where progress has been made, it has almost always been due to either federal or state action, usually in response to court orders. But the persistence of segregation after decades of court rulings requires states to be more assertive. Create county school districts: Although many states have very successful county school districts, consolidating dozens of districts into large countywide school districts would be among the most far-reaching transformations New York or New Jersey could undertake (Connecticut would need to reconstitute county government). Such a transformation would require careful evaluation of costs and benefits, and ways of maintaining community identity and flexibility to meet local needs. Local districts could take advantage of economies of scale and have the tools and authority to promote integration on a wide scale. Consolidate school districts: School-district consolidation occurred rapidly in the early 20th century as the population shifted from rural to urban communities. Over the coming decades, the student population is again expected to shrink in many exurban and rural areas in New Jersey, the Hudson Valley, and Connecticut. Consolidating these districts would be an opportunity to expand services and lower costs. But consolidating largely white, affluent districts with neighboring non-white, low-income districts (Bridgeport and Fairfield, CT, for example, or Hempstead and Garden City on Long Island) would have a far bigger impact on racial integration. The Morristown and Morris Township, NJ, school districts were merged in 1973 to achieve better racial balance; to this day, the combined district remains integrated and 93 percent of its graduates go on to higher education. Designate regional and magnet schools: Regional and magnet schools draw students from several districts, expand educational opportunities for all students, and can help create high-performing, integrated schools. The most prominent and successful example in the region is the Hartford interdistrict magnet program. Forty-five well-funded inter-district schools were created to attract both urban and suburban students. As a result, the share of Hartford students in racially isolated schools has been reduced from 89 percent in 2007 to 54 percent in 2014. Educational achievement is much higher for low-income students attending these schools, and suburban students who choose to attend schools with students of all socioeconomic backgrounds have positive social-emotional development. Allow for inter-district transfers: Inter-district transfers allow students to choose to attend school in a neighboring district. This approach is part of the Hartford reforms and has been used in New Jersey and other states. As a tool for reducing racial isolation, the results have been mixed, and requires both parental preferences and socioeconomic background to be considered in making placements. Share programs and services: Districts can share services and programs to reduce costs and expand course offerings. In New York State, the Board of Cooperative Education Services provides human resources, special education, vocational education, professional development, and other services. While less robust for promoting racial and economic integration than other strategies, it can help small districts create economies of scale and expand resources and opportunities for students in underfunded or poorly performing districts. Each state should set a goal of increasing the number students attending high-performing, integrated schools. A reasonable goal would be to bring school segregation to the national average in 15 years, and provide direction, support, and incentives for school districts to collaborate to meet that goal. The Hartford program and other models have proven that the gap between poor and affluent students and non-white and white students in reading scores, graduation scores, and other achievement measures can be reduced substantially and in a relatively short period of time. The most expensive element of a regionalization strategy would be the creation of regional or magnet schools. They require substantial investments and programs that both provide support for low-achieving students and attract high-achieving students. Connecticut has spent $1.4 billion to build and renovate its magnet schools and $150 million to operate them each year. But this approach also has the advantage of being voluntary for families and students. School consolidation and other approaches also require upfront administrative costs, but should save money in the long term by achieving economies of scale and reducing costs per pupil.